PRAGUE – It might seem an unlikely proposition, but central banking has become exciting. This is not necessarily a welcome development. Decisions taken by the leading monetary authorities since the 2008-2009 global financial crisis have been unorthodox, creative, and at times risky. Their high-stakes choices today will affect the global economy for decades to come. Moreover, central bankers have become more vocal in expressing strongly held positions in the mass media, as if seeking to win over popular opinion. It is a potent and dangerous mix. In this environment, sober, informed voices, like that of the Bank for International Settlements, the central bank of central banks, should also be given a fair hearing. Unfortunately, many central bankers have sought to marginalize the BIS rather than engage with it. One of the most contentious debates has been over when to end the “unconventional” monetary-policy measures that were introduced in the aftermath of the financial crisis to ensure that banks continued to lend, thereby stimulating growth and averting deflation. Some central bankers now worry that ending these measures prematurely will tip the economy back into recession. Yet others fear that the current strategy, though originally intended to prevent an economic collapse, is now sowing the seeds of future instability, including the emergence of another asset-price bubble. In their efforts to resolve such dilemmas, policymakers are also wrestling over whether to focus on traditional monetary tools such as interest rates, or make greater use of so-called “macro-prudential measures,” such as capital add-ons and buffers or adjustments to banks’ loan-to-value ratios. At the heart of the debate – currently being conducted within leading economies’ treasuries and central banks, as well as in supranational bodies such as the International Monetary Fund and the BIS – is the relationship between monetary policy and financial stability. The BIS, for example, has suggested that financial stability is closely connected with monetary policy, and has advised policymakers to start weaning their economies off of easy money sooner rather than later. Central bankers, however, seem to want to try macro-prudential tools first (and sometimes exclusively). It is unusual to witness a clash of views among monetary policymakers that is so radical and clear-cut that it has grabbed wider political and media attention. And, under the public spotlight, some central bankers have sought to downplay the BIS’s assessment, arguing that it is all too easy to issue far-reaching policy recommendations when one suffers none of the consequences should one’s prescription turn out to be wrong. To be sure, a country’s domestic economic circumstances, and the tools available to policymakers, should guide policy. And, though monetary tightening may well be advisable in some economies, it might be inappropriate in others. But the harsh reactions to the BIS’s analysis seem misplaced and unfair. It is always difficult to find the right monetary-policy stance for any given economy at a given moment. Central banks employ an army of experts to try to get it right, and other institutions are seldom so well resourced to present equally sophisticated counter-arguments. The BIS, however, is one of the few organizations that not only has the necessary research and analytical capabilities, but also a track record of making good calls. One should not forget – as many central bankers appear to have done – that the BIS was one of the first to warn of the dangers of financial excesses, several years before the 2008 crisis. The BIS has a right to be heard. It exists not just to represent central banks, but also to offer ideas and intellectual feedback. Indeed, it serves policymakers well by challenging, debating, and perhaps swaying opinion. Rather than bash the BIS, monetary authorities should be grateful for the informed perspectives that it provides. Mojmír Hampl is Vice-Governor of the Czech National Bank. Europe's politicians want monetary easing without pro-growth reform. You can't say Mario Draghi isn't doing his part. 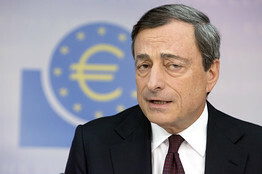 The European Central Bank President once again fulfilled the pleas of European politicians Thursday with another round of rate cuts and the promise of more monetary easing to come. Too bad the politicians keep using Mr. Draghi as an excuse to dodge their responsibility to pass pro-growth reforms. Thus we are getting another round of the Draghi Default, in which monetary policy is supposed to do all the heavy growth lifting for Europe. The central banker obliged by cutting the main lending rate to 0.05% from 0.15%, even though he had said in June the central bank was already at "the zero bound." The ECB also increased the so-called negative deposit rate, or the rate banks will pay for holding deposits at the central bank, to minus-0.2% from minus-0.1%, in a bid to force more bank lending. Mr. Draghi's larger goal is to keep talking down the euro exchange rate against the dollar in a bid to lift inflation in Europe closer to the ECB's 2% target. With inflation at 0.3% year over year in August, and the U.S. dollar getting stronger on the hope of faster U.S. growth, you can at least make a case for easing on monetary grounds within the ECB's mandate to maintain stable prices. Mr. Draghi had already talked down the euro to 1.315 from 1.40 to the dollar since May, and on Thursday it fell again to 1.295 after Mr. Draghi's announcement. Yet further reductions in interest rates, even into negative territory, aren't enough to assuage euro-zone politicians. So in his press conference Thursday Mr. Draghi also announced a version of quantitative-easing lite. For political and legal reasons, expanded buying of government debt a la Washington, London and Tokyo is more difficult for the ECB. Mr. Draghi says he'll instead buy covered bonds and so-called asset-backed securities, or ABS, which are bundles of corporate and household loans. Unlike U.S. credit markets, only some €300 billion ($390 billion) of ABS are outstanding in Europe at the moment. Mr. Draghi has been trying to expand such a market with the new cheap, medium-term lending program he announced in June, and perhaps the central bank's cash can stimulate a wider and deeper credit market. The problem comes from believing that QE is some magic growth elixir. The world's Keynesians have convinced themselves that the U.S. is now growing faster than Europe simply because the Federal Reserve implemented QE while Europe hasn't. That overestimates QE's impact on U.S. growth, which has hardly been gangbusters at a mere 2% average annual rate. But it also underestimates the degree to which European economies are burdened by aging populations, high taxes, regulations on business, and constricted labor markets. Mr. Draghi understands this, which is why he keeps repeating as he did Thursday that Europe needs "ambitious and important" reforms "first and foremost" to return to growth. Yet those reforms never arrive, and now the politicians have another excuse to delay as they wait for an ABS program to start next year. This has already happened once on Mr. Draghi's watch, when his promise of unlimited sovereign bond purchases in 2012 pushed government bond yields so low so fast that it eased credit-market pressure on governments to reform. The other danger is that Europe will interpret the ECB's opening for more fiscal policy stimulus as an excuse for more government spending. Mr. Draghi has hinted at easing the EU's deficit limits. This would make sense if politicians followed through with pro-growth tax cuts as Spain has. But another burst of government spending won't spur growth and would only set the euro zone up for more tax-raising austerity later. Europe's main economic problem is a political class that doesn't want to address the structural impediments to growth that have nothing to do with monetary policy. Mr. Draghi is being asked to perform miracles he can't deliver.